Palm Sunday is the start of Holy Week. At 10am in St Michael & All Angels Church there’s a Palm Procession and Choral Mass. Preacher: Canon John Record. Music: Introit: Hosanna – Weelkes; Mass setting – Gibbons; Anthem: Hear my prayer O Lord – Purcell. Service details. At 7.30pm, there’s a Sacred Concert: Readings and Music for Passiontide, including JS Bach’s Jesu meine Freude and organ music. There are services at 8pm throughout Holy Week. You can read a liturgical guide to our Easter services by St Michaels’ master of ceremonies Cathie James. – On Holy Monday (April 10th), Holy Tuesday and Holy Wednesday at 8pm, the sermons will be given by Fr Edward Barlow, curate. – Thursday April 13th is Maundy Thursday. At 10.30am, at St Paul’s Cathedral, there is a Chrism Mass. At 8pm in St Michael & All Angels Church, there is the Choral Mass of the Lord’s Supper. Preacher: Canon John Record. Music: Gjeilo – Ubi Caritas, Gesualdo – O vos omnes. – Friday April 14th is Good Friday. At 11am, at St Peter’s Southfield Road, there is Children’s Stations of the Cross. 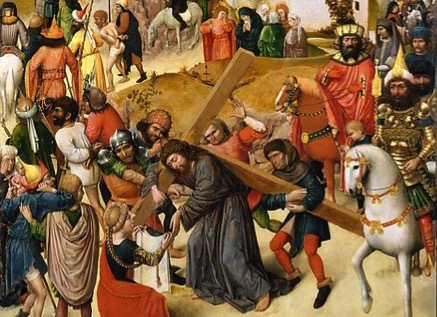 At St Michael & All Angels, at 12 Noon there’s the Children’s Passion; at 1pm Stations of the Cross; at 2pm Liturgy of the Passion with Holy Communion. Music: Vaughan Williams – Valiant-for-truth. At St Peter’s at 8pm there’s Choral Tenebrae. Details of all our Holy Week services. – Saturday April 15th is Holy Saturday. At 11am at St Michael & All Angels Church, the Youth Church will create their Easter Garden outside in the church grounds. More information from Fr Edward, Mthr Sarah or Christina via the Parish Office. – Sunday April 16th is Easter Day. At St Michael & All Angels at 5am, there’s the Vigil and First Mass of Easter, which Father Kevin calls the best service of the year! Preacher Mother Sarah Lenton. Music: Vierne Messe solennelle. Followed by a cooked breakfast in the Parish Hall. All welcome. At 10am it’s the Choral Parish Mass of Easter, for all the family (with egg-rolling – and eggs for all children). Preacher: Fr Edward Barlow, curate. Music: Mascagni – Easter Hymn. At 6.30pm, there’s Evensong and Benediction. Preacher: The Vicar. Details of all our Holy Week services.